The crucial weekly meeting of the MCD was today postponed amidst speculation that the ruling Congress wanted to avoid the embarrassing debate over the recent arrest of the Deputy Chairman of the Standing Committee, Mr Ashok Jain, in a bribery case. A large lotus in full bloom, delicately carved out of stone, is the latest addition to the samadhi of the late Prime Minister Rajiv Gandhi, giving a new look to the memorial at Veer Bhumi here for the 60th birth anniversary celebrations. Fed up with daily fights, a woman set her husband on fire last night in Gokul Puri area of northeast district. He was taken to the GTB hospital where his condition is said to be critical. The Government of NCT of Delhi has increased the vend fee on various categories of liquor sold by the Canteen Stores Department (CSD) with the objective of reducing the difference in price between the market rate and the CSD rate. To promote education among the children of gangsters and others allegedly involved in crime and criminal activities in the twin cities of western Uttar Pradesh - Ghaziabad and Noida - the South Asia NewsNetwork International (SANI), a newly established non-government organisation, has decided to organise a district-level essay competition in Hindi and English on September 4. It’s back to basics for the Delhi Pradesh BJP. After successive defeats in the 2002 civic election, 2003 Assembly poll and this year’s parliamentary election, the party is getting back to the “local worker” in a bid to drum up support at the grassroots. The University of Delhi has developed a Naked Eye Visual Erythrocyte Agglutination (NEVA) assay technique to detect HIV antibodies in blood samples, but it has not been included in the National AIDS Control Programme due to high cost, the Lok Sabha was informed today. A married woman of a village in the district committed suicide along with her four minor children, including a nine-month-old infant. 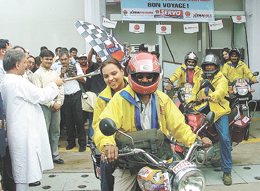 Mr Pranab Mukherjee, Defence Minister and Mr Mani Shankar Aiyar, Minister of Petroleum and Natural Gas and Panchayati Raj, flagged off a motorbike expedition to Ladakh via Kargil at IndianOil’s Irwin Road Service Station here today. The Ghaziabad Development Authority will seal more than 200 buildings constructed or extended by violating the approved house plans. The Congress leader and the president of Gramin Bharat, a social organisation, Mr Ved Prakash Vidrohi, has called for a change in the norms connected with the hoisting of the Tricolour on Independence Day and Republic Day in the state. New Delhi: The Amity International School, Noida, celebrated the 58th Independence Day. A guard of honour was presented to the chief guest, Dr Amita Chauhan and the guest of honour, Lt.Col. A. K. Sharma. Lt. Col Sharma addressed the gathering and urged the students to put in extra efforts in everything they do. New Delhi: With the arrest of a person, the Delhi police claims to have foiled a murder attempt in Palam Colony. The move by the ruling Congress apparently caught the BJP off guard as the Opposition members had prepared to corner the ruling party on the issue of corruption and anomalies in the property tax. The Congress, however, said that it had postponed the weekly meeting as most of the councillors were busy in preparation for the All India Congress Committee meeting to be held on August 21. The Mayor, Mr A. R. Verma, the Chairman of the Standing Committee, Mr Mukesh Goel, and the Leader of the House were called by the Chief Minister, Mrs Sheila Dikshit, to discuss the trifurcation issue, sources said. The Leader of the Opposition, Mr Subhash Arya, said that the Congress, which was avoiding discussion on the issue of corruption, was now trying to put extra financial burden on the corporation by trifurcating the MCD. At present, the corporation has only one Municipal Commissioner, Mayor, Leader of the House and Chairman of the Standing Committee. Once the MCD is trifurcated, it will have three Municipal Commissioners, three Mayors, three chairpersons and Leaders of the House. The Corporation is already faced with financial crisis and unable to disburse salaries to the teachers, he claimed. Arya claimed that the total expenditure for the MCD unit of the Trans-Yamuna area has been estimated at Rs 500 crore while the income will be Rs 46 crore. How will the Congress manage to run the Corporation if it has to be trifurcated, he questioned. The Leader of Opposition in the Standing Committee in the MCD, Mr Vijender Gupta, today demanded that the rebate and concessions recommended by the Hardship and Anomaly Committee for various categories of property owners under the Unit Area Method (UAM) scheme should be accepted without any change. He said that if the recommendations were diluted, the very purpose of implementation of the UAM would be defeated. The Congress and the Municipal Commissioner were equally confused about its implementation, which was apparent from the conflicting statements of the leaders. This, in turn, was bound to generate more corruption than was the case under the previous Ratable Value Scheme (RVS). Mr Vijender Gupta alleged that the Congress was creating hurdles for the taxpayers and creating confusion to serve its political ends. As far as senior citizens’ age limit is concerned, it can be changed after only carrying out an amendment in the DMC Act. In the Act, it has been mentioned that a man of 65 years of age can be given the benefit of a senior. With the stone flower installed at the centre of the samadhi, the place is now truly symbolic of the late leader whose name means “lotus”, said Romi Chopra, a close family friend and member of the Concept Committee entrusted with the task of developing the sprawling memorial. The huge stone lotus is the work of the famous sculptor, A. Ramachandran, who took several months to chisel it out. Taking time off from giving finishing touches to the samadhi for the 60th birth anniversary celebrations on August 20, Chopra said that on that day, a bronze ‘kalash’ (urn), specially brought from the Gandhi family’s ancestral home Anand Bhawan in Allahabad, bearing lotuses, will be placed on top of the stone flower. The samadhi has been developed gradually over the last decade and now it is almost complete. Forty-six small lotuses carved out of grey stone, symbolising the number of years that he lived, were placed on the samadhi in the last few years, which surround the big lotus that has now been installed. Explaining the design of the samadhi, interior designer Sunita Kohli also a member of the Concept Committee, said, “A range of elements – from greenery to stone to wood to metal— have been used to create it. Surrounded by greenery, the samadhi is ringed with black stones and the pathway to the memorial is made of wood..” Stone brought in from south India, on which waves have been carved, and which is interspersed with the 46 lotuses, symbolises the cosmic ocean,” she added. “The memorial has been developed with a lot of care and thought under the guidance of Sonia Gandhi,” Chopra said. With its huge collection of rocks from all 27 states of the country, together with adjoining Shakti Sthal, the samadhi of Indira Gandhi, it has become the largest geological park in the world, he said. Meanwhile, a special programme has been planned to celebrate the 60th birth anniversary of Rajiv Gandhi, with around 120 children from Delhi schools set to take part in the prayer meeting at the samadhi on August 20. “The children will sing songs and later will also write their wishes for Rajiv on large canvasses,” said Kohli. “There will also be a victory run, symbolising the hopes of this generation as a speech of the departed leader will be played back,” she said. Fed up with daily fights, a woman set her husband on fire last night in Gokul Puri area of northeast district. He was taken to the GTB hospital where his condition is said to be critical. According to the police, Ajay Misra (27), who works in a factory in Noida, had married Suman three years back. They used to fight over family matters. Annoyed with the fights, she bought petrol and stored it in the house. Last evening, the couple again had a petty fight following which Suman poured petrol on Ajay and set him ablaze. Though his cry for help was not initially heard by the residents, but later they turned up for his help and took him to GTB hospital. The North District police have arrested one Rakesh, a resident of Ashok Vihar, from Pul Mithai yesterday evening. He was reportedly declared a proclaimed offender in a case under the Excise Act in the Kashmiri Gate police station area in 2002. The Delhi Police have declared a reward of Rs 10,000 for providing information about a body of a 25- year-old man found near the Burari Authority. The police said that the body had injury marks on his ribs and back and multiple wounds on the face. However, it has been observed that the effect of the policy is not uniform on all categories. The new excise policy does not segregate rum into premium and economy categories. A premium quality rum enjoys the same vend fee as an economy brand of rum. While the difference between the market price and the CSD price of an Indian Made Foreign Liquor (IMFL) brand in the premium segment has reduced considerably, there is a large difference between the market and the CSD rates for premium rum brands. Royal Challenge brand of whisky is placed in the IMFL economy and medium segment. Its maximum retail price (MRP) in the open market is Rs 380 as against the old CSD rate of Rs 175 and the new CSD rate of Rs 287. Similarly, Teachers Scotch whisky is priced at Rs 950 in the open market and Rs 481 (the old CSD rate) and Rs 591 (the new CSD rate). In contrast, Bacardi Carta Blanca and Old Monk brands of rum are placed in the same category. The former costs Rs 400 in the open market as against Rs 148 (the old CSD rate) and Rs 164 (the new CSD rate). Old Monk costs Rs 180 in the open market as against Rs 56 (the old CSD rate) and Rs 72 (the new CSD rate). There is, therefore, a scope for buying rum from the CSD and selling it in the open market at a higher price or at the market price. The scope for leakage of rum is likely to remain high as compared to IMFL. Is the excise minister listening? The competition will be organised in various schools, Mr Anand said, “We simply want to provide such children an educational infrastructure to enable them to join the mainstream of the socio-economic-educational and cultural development.” The principals, teachers, guardians and, more importantly, the children from various walks of lives will encourage them by participating in the competition, Mr Anand added. According to Neena Jha, the organising secretary of SANI, the competition will be held in two groups. While the students of class six to eight will take part in the first group, the second group will comprise the students of Class IXth, Xth and XIth. Each participant will have to write 300 words on the topics. The participants will have to submit their application forms to their respective principals. The competition will be held in their respective schools on September 4. The winners of each group will be awarded. As many as 8000 students will participate in the event, Mrs Jha said. The SANI has also decided to bear the tuition fee of at least five students of the districts who have lost their fathers - subject to their performance in the school. She said that SANI has taken the responsibility for tuition fees of two students – one is studying in class – II while the other is in class VII – of St. Thomas School in Indirapuram. The Special Branch of Delhi Police has claimed 100 per cent conviction in espionage cases. In all the cases, the persons had been arrested for passing defence related classified information to Pakistan and for spying on behalf of that country. The police officials said that there were more than a dozen cases over a couple of years in which all the accused had been convicted. The Special Branch has an anti-espionage section, which has been dealing with these cases. The investigation team consists of Inspector Madanjit Singh, sub inspectors Hari Ram, Risal Singh, Head Constable Rajinder Singh and Raghubir Singh. The newly appointed in-charge of the party’s affairs in NCT of Delhi, Mr Kalraj Mishra, has said that the party wants to draw up a micro-management plan to reactivate the local worker who is the only means for a political party to gauge the mood of the people. He said that re-establishing touch with the people at the grassroots was a must to restore to the party its lost glory in NCT of Delhi. He said that so much is done at the state and district level but little is done at the Mandal and local level, a trend that should be corrected. Mr Mishra has indicated that the organisational election would be held soon. When asked if there are any plans to overhaul the Delhi Pradesh BJP in view of its crushing defeats, he said that that would come later. His priority is to conclude the organisational election. After the election, he said, they would sit together and discuss their strategy for revitalising the party in the Capital. The Union Minister of State for Health and Family Welfare, Ms Panbaka Lakshmi, said in a written reply that the Department of Biotechnology of Delhi University’s South Campus had developed NEVA, which had been licensed for marketing by the Drug Controller General of India. The Department had transferred the technology to M/s Cadila Pharmaceutical Ltd., Ahmedabad, after evaluation of its efficiency. However, NEVA, which takes up to 30 minutes to evaluate HIV status of a person through blood samples, had not been included in the National AIDS Control Programme, she said. AIIMS EXPANSION: The government has approved the construction of a Centre for Dental Education and Research at the All India Institute of Medical Sciences, Ms Lakshmi said in another reply. Two projects namely, Jai Prakash Trauma Centre at Raj Nagar land of AIIMS and Dr B.R. Ambedkar Indian Rotary Cancer Hospital at AIIMS were in the process of completion, she said. Post Office Fraud: The Department of Post and Telegraph has suspended four officials for certain lapses that led to a fraud of Rs 24 odd lakh by some SAS agents from the Monthly Income Scheme accounts of certain depositors at the Krishna Nagar Post Office in Delhi, the Union Minister of State for Communication and Information Technology told the Lok Sabha. He said that a case had been registered and instructions issued that no amount be permitted to be withdrawn without proper checking. A married woman of a village in the district committed suicide along with her four minor children, including a nine-month-old infant. The woman, identified as Omvati, 32, wife of one Vijender, a resident of Chandpur village of the Ballabhgarh subdivision, allegedly poisoned her kids and herself after a reported tension with her husband over some issue. While the youngest of them died on the way to hospital, the rest succumbed to poison in a hospital in Delhi. Besides the woman, the other deceased were identified as Ombir (10), Urmila (7), Rinku (3) and Kirtan (nine months). The husband of the woman is reported to be working as a helper at a police chowki near Tigaon village. The woman, who had a quarrel with her husband last night, reportedly gave some eatables laced with poison to the kids before consuming the substance herself. No one has been booked so far. This is the fourth incident in the town in which a woman had attempted or committed suicide along with her kids, after a dispute in the family during the past one month. Ghaziabad: Two young lovers in village Atuta in Babugarh died after drinking soft drink laced with poison as part of a mutual suicide pact. Some village women, who had gone to collect grass, came across the bodies lying in the field. When they raised the alarm, a large number of people came running. Soon the police from Babugarh police station reached the spot and rushed the lovers to a local nursing home. The girl was declared brought dead while the boy struggled for life and expired after a few hours. According to Babugarh police, the lovers had consumed the soft drink in the field. Empty wrappers of sulphus and the dresses of lovers were also recovered, though there was no note. The deceased have been identified as Kavita Balmiki, daughter of Maan Chandra, resident of village Mehdoodpur under Gulawathi police station and Promode Balmiki, son of Harish Chander of village Kaloli, under Bulandshahr Dehat police station. SO police station said that Promode had told him before losing consciousness that they were madly in love. Since society did not approve of their relations, they had decided to take the extreme step. The police said they had informed the families of both Kavita and Promode. But nobody from their families turned up at the police station or the hospital, the SO said. Sponsored by IndianOil, the expedition has been organised by the Bikers for Integration and Conservation of Environment (BICE). Mr Mani Shankar Aiyar, also released the expedition commemorator in the presence of Mr Pranab Mukherjee, Defence Minister; Mr M S Ramachandran, Chairman, IndianOil; Dr N G Kannan, Director (Marketing), IndianOil; Mr Kuldeep Bery, General Manager (Delhi and Haryana State) and other senior officials of IndianOil. On the occasion, Mr Aiyar remarked that the expedition had the inherent theme of foreign friendships while overcoming challenges. He also said that on their way, the expedition members would touch the Himalayan ranges passing through Drass, Kargil and Srinagar criss-crossing several Trans-Himalayan passes and arduous terrain, adding that the expedition, would help forge a closer bond with the people of those regions through which they pass, promoting national integrity and spreading the message of peace. Mr Mukherjee said that he was happy to note that the indomitable members of Bikers for Integration and Conservation of Environment were back again for undertaking yet another journey in the series of thrilling adventures on the Himalayan tracks. He said that the expedition would be a tribute to the courage, patriotism and resilience of our armed forces. He complimented IndianOil on sponsoring the expedition. GDA Vice-Chairman D.P. Singh said that all illegal constructions in the garb of apartment complexes in the Mahanagar would be sealed in three days. About 200 such buildings have been identified. The GDA has viewed seriously a building sealed after the High Court orders in Raj Nagar, he remarked. The GDA will conduct its own probe into the matter, he added. GDA Chief Engineer S.P.S Raghav is understood to have called for the list of buildings being constructed. The GDA has not taken this decision on its own, but has been spurred into action by the Allahabad High Court summoning the file relating to the construction on plots No. 12/51 in Raj Nagar. The High Court orders have made the GDA brass sit up and take notice of all illegal constructions. SPS Raghav is understood to have called for the complete list of buildings being constructed illegally in violation of approved plans. Mr Raghav has instructed the engineering officers in charge of various sections of GDA for a complete list of buildings in Raj Nagar, Kavi Nagar, Shastri Nagar, Sanjay Nagar, Vivekananad Nagar, Chiranjiv Vihar, and Nehru Nagar. A list of across-Hindon colonies like Shalimar Garden, Ram Prasth, Vaishali, Indirapuram, Surya Nagar, has been called for, along with the buildings being constructed in other areas. The name of the assistant engineers concerned and the details of the present stage of construction have clearly been sought, according to GDA sources. The sources said all this action is being taken against the construction of illegal units’ in each building blocks and misuse of residential premises for commercial use. The GDA has woken up to this as the High Court had taken a grim view of the whole situation. The violations of building laws and converting parking spaces into commercial use areas in the multi-storey flat complexes in Surya Nagar, Raj Nagar colonies in Mahanagar had been challenged through a PIL in the Allahabad High Court. The PIL had prayed that the High Court issue suitable instructions to stop the misuse of the premises for commercial purposes. The allottees had raised the issue with the senior officers of the GDA after the High Court orders. Since the GDA has turned a deaf ear to their pleas, they have again knocked at the doors of the High Court through a PIL. The GDA has prepared sanction letters clarifying that if the parking spaces in buildings are used for commercial activities during monsoons, the builders themselves will be responsible for the water logging in the buildings. DM Santosh Yadav said that all those buildings, dwelling units constructed in violation of building laws will not be registered. It is well known that the GDA engineers know about the illegal activities, but tend to overlook them, he added. He has demanded that instead of allowing the bureaucrats to hoist the flags, the government should hand over the responsibility to the elected representatives or the freedom fighters. In a statement here today, Mr Vidrohi claimed that the present policy was a reminder of the bad old days of the British rule, when the officers of the government had special powers and rights and no member of public had democratic rights. He said the officers were servants of the people and the government cannot assume supremacy over the elected representatives of the people or the individuals who fought for the country’s freedom. He claimed that it has been reported from various places that MPs, MLAs, zila parishad chiefs and chiefs of the block samitis, who are invited to such functions, do not get due respect, while a middle-level official of the state government is allowed to be the chief guest and asked to hoist the flag. People’s representatives are just expected to sit in the audience, Mr Vidrohi regretted. Claiming that the Panchayati Raj Act, which is still to be implemented properly, gives the MLA a higher status than the Chief Secretary of the State. Besides, the chief of the zila parishad enjoys the status of a cabinet minister, he said. It is gross insult to the elected representatives, when an official is asked to preside over important national functions, Mr Vidrohi remarked. He said the time had come when the government should realise the ground reality and provide the status to those deserving, as the present system was an insult to the democratic set-up of the country. The government should officially ask the local MPs or the MLAs to preside over such functions. In case of their unavailability, he said, the duty could be assigned to the chief of the zila parishad or block samiti or a freedom fighter. New Delhi: The Amity International School, Noida, celebrated the 58th Independence Day. A guard of honour was presented to the chief guest, Dr Amita Chauhan and the guest of honour, Lt.Col. A. K. Sharma. Lt. Col Sharma addressed the gathering and urged the students to put in extra efforts in everything they do. The Principal, Mrs Mohina Dar, motivated the students to serve their nation. A colourful cultural programme was presented by the students. The function culminated with a kite-flying competition. Vimmy Ghai won the ‘ZAK Jewels 2004’ jewellery designing contest to herald the wedding season in the Capital. Ms Ghai, who received a diamond ring for her victory, was among the nearly 50 amateur and professional participants. The incident occurred last night when two persons, Amit and Bhupender, came to Naseerpur DDA colony and picked up one Accent car (HR-26-N-6223) and escaped. Later, the local people informed the police control room about the incident and a message was flashed immediately to all the PCR vans.